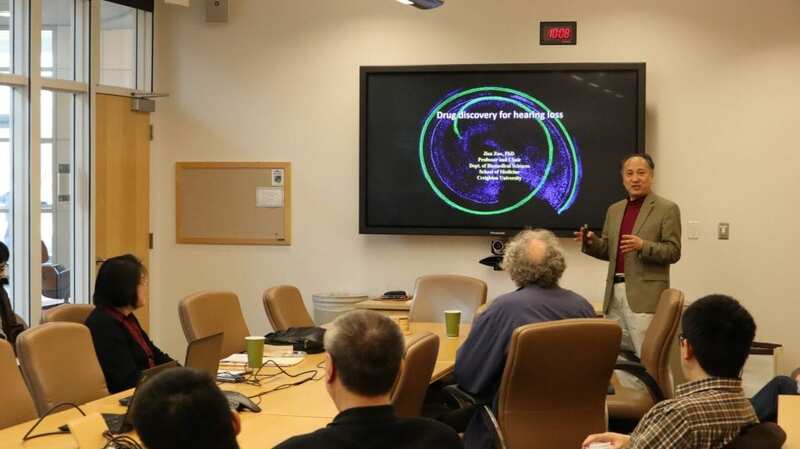 Dr. Jian Zuo gave a seminar over drug discovery for hearing loss on Thursday, March 14th at OU. Dr. Zuo is a chairman and professor from the Department of Biomedical Sciences at Creighton University School of Medicine. Abstract: Hearing loss caused by aging, noise, cisplatin toxicity, or other insults affects 360 million people worldwide, but there are no Food and Drug Administration–approved drugs to prevent or treat it. We first performed high-throughput screens for small molecules that prevent cisplatin-induced hearing loss in a cochlear derived cell line. The hit compounds were further validated in cochlear explants, zebrafish lateral-line neuromasts in vivo, and eventually in mouse and rat’s cochleae in vivo. We have so far identified and characterized several potent compounds that exhibit protection against not only cisplatin but also antibiotics and noise-induced hearing loss. We further investigated several targets of top compounds in knockout mouse models. To treat hearing loss, we first developed genetic mouse models in which hair cell regeneration occurred at adult ages. Based on the genetic manipulations, we performed high-throughput screens of small molecules that mimic the genetics models. We further tested these top compounds in adult mice for hair cell regeneration. Combinatory applications of these top compounds could provide therapeutic intervention of hearing loss in clinics. Biography: Jian Zuo obtained his B.S. in Biomedical Engineering at Huazhong University of Science and Technology in Wuhan, China in 1985. He then immigrated to the US for his Ph.D. in Physiology from UCSF in 1993. After postdoc training in Rockefeller University, he became a faculty at St. Jude Children’s Research Hospital in Memphis since 1998. After 20 years, he recently moved to Creighton University School of Medicine as the Chairman and Professor in the Dept. of Biomedical Sciences in April 2018. He has published >100 research articles and >20 reviews with high impacts. He currently has 2 R01 grants, 2 DoD grants, and one MRC grant. He has trained many successful students and postdocs and has interests in the commercialization of his discoveries.